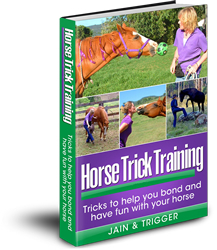 Would you like our complete step-by-step guide to GETTING STARTED with horse trick training? This simple and easy-to-read 50 page eBook shows you everything you need to know to get started with trick training. Includes links to over 15 training videos. This eBook contains links to over 15 training videos that show you step-by-step how to teach your horse simple tricks. Once you learn these principles you can use them to teach your horse just about anything! You only need to train your horse for 5 minutes a day to make real progress. It is easy to fit trick training in around your daily horse chores and activities and we show you how to do this. A lot of trick trainers just show their experienced trick horse doing tricks. That’s not much help if you are just starting trick training! So we show you Bella, our new horse, learning tricks from the very beginning. Start horse trick training today! Join Trigger and me as we show you step-by-step how to start trick training. All our training is 100% horse friendly. No whips, ropes or force is used. 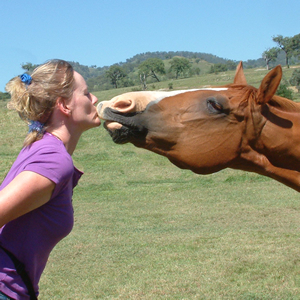 Your horse will LOVE this type of training and it will really help to improve your bond and friendship.